Ligaments connect bones together and tendons connect to bones. If they become weak and stretched from injury or aging, they may cause you pain and discomfort. Sometimes ligaments do not heal completely. When ligaments and tendons are stretched, they do not stabilize a joint properly and, therefore, we experience pain. 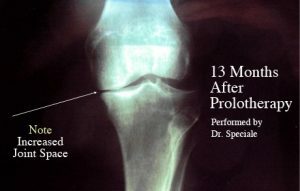 Prolotherapy (also referred to as Stimulated Ligament and Tendon Repair) is the introduction of an irritant solution by means of injection into the weakened ligaments. The irritant solution is usually made up of an anesthetic (Lidocaine) and Glucose (sugar) H20. The proliferant stimulates the production of fibrous tissue and new collagen tissue which will ultimately make your ligaments stronger – permanently. Dr. George Hackett (the father of Prolotherapy) began successful use of Prolotherapy in 1956. I trained under Dr. Gustav Hemwall (his premier student) who is the world expert in Prolotherapy and is the author of Ligament and Tendon Relaxation by Prolotherapy. Dr. Hemwall reports up to an 82% remission of pain using this same technique. I draw various lines on the area containing the weakened ligament or tendon. Then I inject approximately 1 cc of the irritant solution into each defective ligament or tendon. When the local anesthetic has worn off after 2 to 3 hours, there is a sense of bruising that may last up to one week. This is an important signal that healing is under way. There are usually no other side effects. The injection will be given at 3 to 6 week intervals. It is important to realize that you may not expect relief from your pain for 6 to 8 weeks at the earliest. 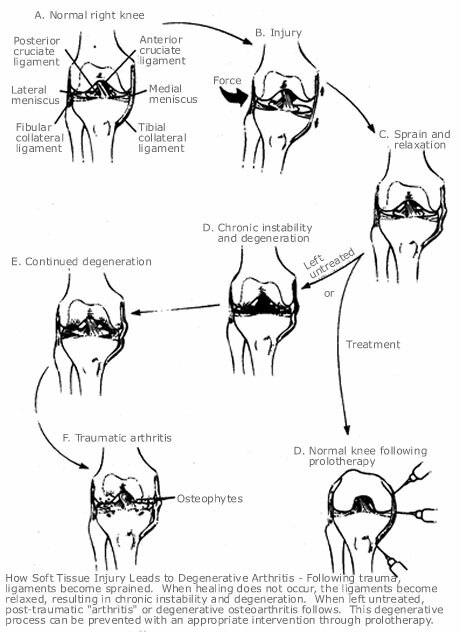 It takes at least 6 to 8 weeks for the new ligament to grow. 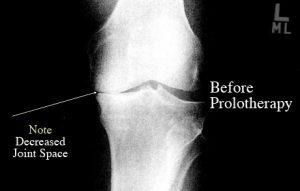 Every patient is unique and responds differently to Prolotherapy. It may only take one treatment to help you or it may take multiple sessions. 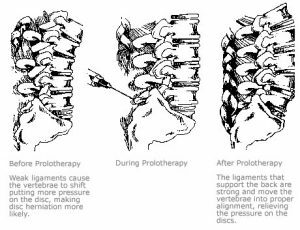 Above image taken from Ligament and Tendon Relaxation Treated by Prolotherapy © 1991, Gustav A. Hemwall, M.D.